Who has a right to pain they haven’t experienced? Who gets to strip their sleeves and show the scars from wars they haven’t fought, wounds they haven’t sustained? “Survival” is a recurring theme in Bad Jews, Joshua Harmon’s generously envenomed, no-blow-too-low cage match of full-contact identity politics, and, no matter how richly contemptible the combatants get, no matter how cocooned and blinkered and implosively selfish they prove themselves to be, we never doubt they’re fighting for their lives. They are: laconic, nonconfrontational Jonah (quietly brilliant Philip Ettinger), his icily entitled, frictionlessly secular older brother Liam (Michael Zegen), Liam’s wanly honey-sweet girlfriend Melody (Molly Ranson, pitch-perfect and marvelously restrained), and passionate, diabolical Daphna (Tracee Chimo), Liam’s cousin and the family’s resident “superjew.” The theater of war: A beloved grandfather — and Holocaust survivor — has died, and a family heirloom with religious significance is up for grabs. Liam has it. Daphna wants it. Somebody’s gonna get it. The irony being, of course, there isn’t a soul on stage who doesn’t reek of cliché, Daphna included and foremost. But, like all great antagonists, Daphna is almost entirely impervious to self-knowledge. Liam doesn’t wince much either: In Zegen’s capable hands, he’s his own kind of horror, with unmistakable threads of misogyny running through his faultless tapestry of deracinated progressiveness. He’s as detached as he can afford to be — which is pretty damned detached, since he’s rich — and he’s aware of this and makes no apologies. Melody’s presence touches off an entirely predictable battle over shiksa incursions into the Tribe, and Vassar-liberal Daphna verges into the rhetoric of racial supremacy to attack Liam’s gravitation toward “this piece of … music.” But Liam would, by the same turn, scrape the Daphnas of the world from his shoe; even her hair — especially her hair — offends him on a genetic level. (“It’s like having a dog in the house!”) Bad Jews is a fast, young play about hate, the most delectable kind of hate: intratribal. It’s a flavor of hate very much in season right now, and it lifts the show out of cultural specificity and towards a more universal loathing. “People are just people!” protests Melody in the play’s inevitable why-can’t-we-all-just-get-along moment. And people are just people: That’s precisely what people can’t accept, and that’s what Bad Jews homes in on. From Joseph’s coat to Jacob’s mess of pottage, people just being people has never stopped people from trying to differentiate themselves, usually via the diminution of others. What a glorious mess of pottage Harmon, Aukin, and this altogether flawless cast has created here. What an incredible bridge they build — and then burn — between the identity politics of the Baby Boomers and the identity curation of the Facebook generation. What an incredible opportunity to unite and divide those two audiences, in this theater and perhaps (a boy can dream) in a larger one? The show scales up more readily than I’d have thought, and in the right house, this could be a Broadway show. Bring it. 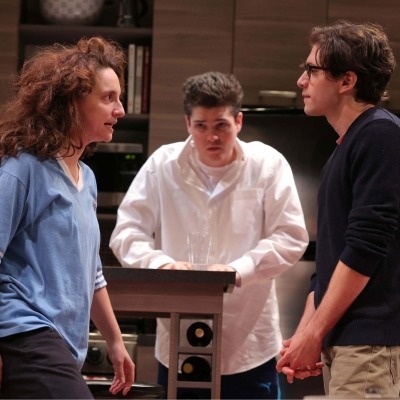 Bad Jews is at the Laura Pels Theatre through December 15.